1969-70 Mustang Fastback Quarter Window Handle Anchor Bolt with Seals. 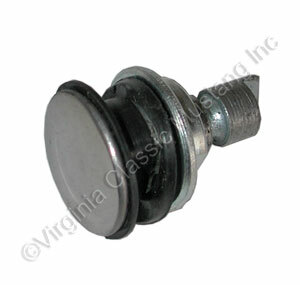 This is the special stainless capped bolt that is seen from the outside of the car and goes through the quarter window glass where the handle is attached. It includes a special nut and two molded rubber pieces that seal between the bolt and glass. Very nice to have when replacing the handles as originals are usually rusty. Sold each. Need 2 per car. Fits RH or LH.